Whilst you are staying in our hotel you can take a gentle hack through the New Forest. It is a pleasure not to be missed. The great beauty of a hack from Brockenhurst is that you go straight out onto the forest. Just cross the road from both yards, and you are there. 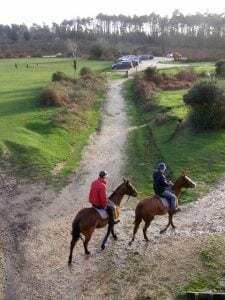 Whether you are a complete novice, have had a few lessons or you are a bit of an expert, the riding stables in Brockenhurst have a horse for you to ride. 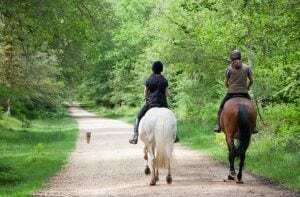 These easy hacks go out several times a day from two stables in Brockenhurst: Ford Farm and Brockenhurst riding stables. Prices for one hour are from £35 per person. You see things differently on horseback. We were out hacking from Brockenhurst and came across a herd of red deer. Because we were on horseback the beautiful red deer didn’t even notice we were there. The magnificent stag allowed us within a few feet of his does. We were silent. Holding our breath. Trying not to stir, smell, make a noise or do anything that would disturb them. It was such a rare thing to happen that we couldn’t believe we could come so close. The horses did the trick. We had just enjoyed a long canter across the open moorland. It was autumn, the ponies were steamy and calm. The day was a little foggie and just a touch chilly. Everything was magical when we came across this peaceful herd of red deer. Sitting, silent, unworried by these horses going past, didn’t notice us on board. Hacking out across the forest is fun. Trudy runs Ford Farm in Brockenhurst. Her stables are a great place to start if you are new to horse riding. She has an amazing selection of ponies and horses for all age groups and abilities. A very experienced rider herself she knows all there is to know about New Forest ponies and riding out on the open forest. Brockenhurst Riding Stables is relatively new to the village, but not new to horseriding. Formerly at Burley Manor this stables offers hacks through the beautiful Standing Hat part of the New Forest. If you are riding for the first time you need to bring with you boots or shoes without buckles or laces. You need a waterproof if it looks like rain (and you will need to wear it as you are leaving. Changing on horseback is tricky). You will need a riding hat. If you don’t have one yourself the stables will provide you with one. However, you will need to get there early to claim one because some hats can be better than others. You will normally be asked to sign a disclaimer before you go out on the ride. Riding is a risk sport. Whilst all the stables in the New Forest are very professional and all the people who take you out will be experienced, it is still possible for the unexpected to happen. It is possible you might get hurt. You need to know you are taking a risk before you book. And, the riding stable will only take responsibility for that risk if they have done something that is negligent. So it is worth making sure that you listen carefully to their instructions. I’ve ridden out on the forest many times and never seen an injury. Mostly because the stables take very good care of their customers. Please feel free to ring and chat to me if you want to go riding. My name is Christina and I am the owner of the Cottage Lodge Hotel 01590 622296. Why not have a look at our rooms here?